“The type of tunic I chose to reconstruct is a narrow sleeved example; a great many of the narrow sleeved tunics of the late antique period appear to be extremely wide, and I wanted to see how they actually looked when worn, so I chose a simple one to reconstruct. The basic measurements of the tunic came from one catalogued in A. De Moor’s 1993 book ‘Coptic Textiles from Flemish Private Collections’ (cat. no. 6). This complete example dates from the 3rd to 5th c. AD and is a narrow-sleeved tunic of undyed linen. It features a waist tuck and bands, possibly for reinforcement running vertically from shoulder to hem. It was probably worn as an undertunic beneath another tunic of either wool or linen that would feature coloured decoration. 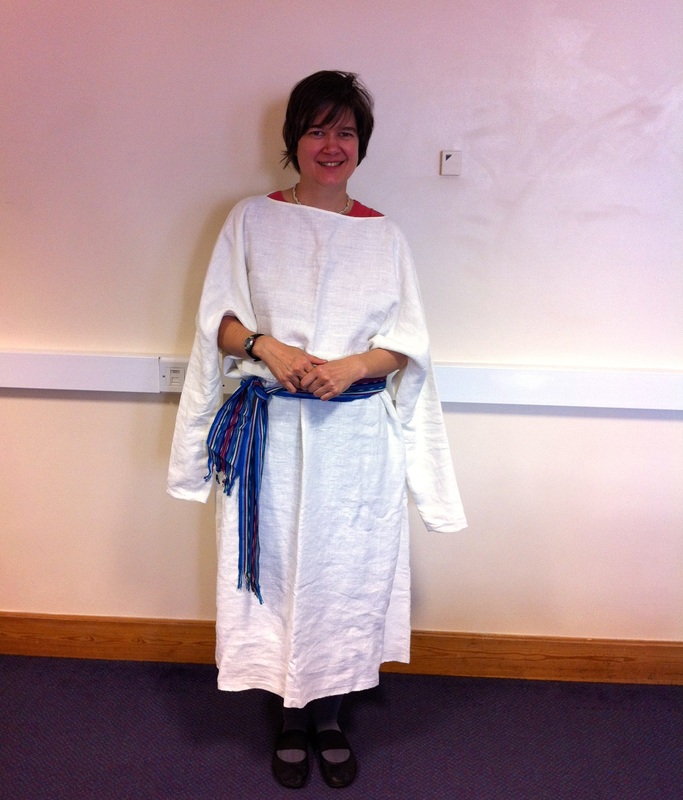 The tunic’s dimensions are 188 x 248cm, including 2 sleeves of 44 x 35 cm each. 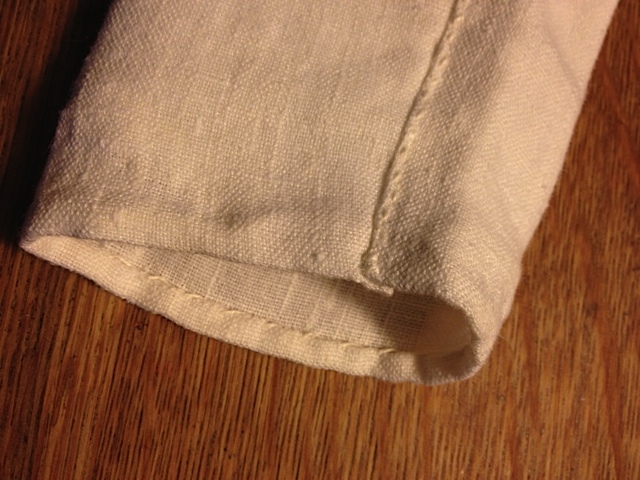 My reconstruction was made in 100% linen fabric that had been pre-washed. Narrow sleeved tunics such as this were normally ‘woven to shape’, however as this was not possible I had to find fabric wide enough to cut the garment out in one piece. This too proved difficult and in the end it was cut out in 3 pieces: one large rectangular piece going across the garment from cuff to cuff and including the neck opening, and 2 smaller equal sized pieces making up the back and front body of the tunic. 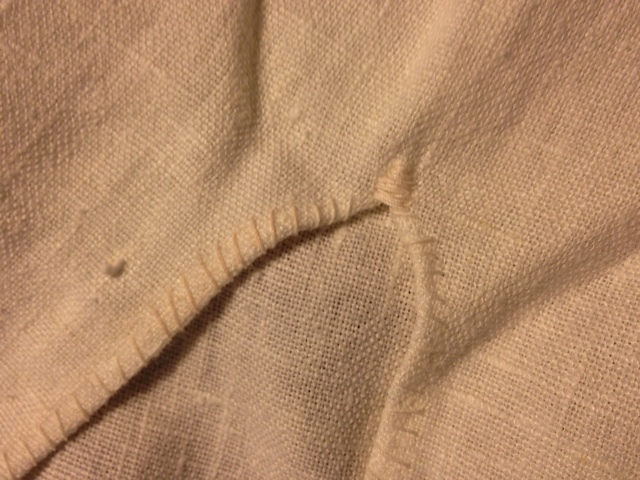 The pieces were then seamed by hand, and the seam was included in the waist tuck – a number of tunics have been found that were assembled in this way. The sleeves were tapered to the cuff by folding the excess fabric inside the sleeve in a triangular shape from armpit to cuff and then hand stitching it in place. An opening was left at the underarm going from the top of the waist tuck and continuing approximately 10 cm along the underarm. The measurements of the waist tuck and the underarm opening were based on measurements taken (by me!) on a number of extant garments in collections across Europe.